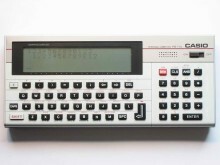 In the first half of the glorious 80s, some manufacturers, mainly the Japanese Casio and Sharp, battled for dominance of one of the most creative segment of personal computing: the pocket computers one, made of hybrid machines, halfway between a scientific calculator and a laptop. The Jewel seemed to have a memory problem because, although having no program stored in its 10 slots, it returned an error code related to a memory shortage. I feared the worst, since the ram chips installed in these vintage machines are no longer easily available. 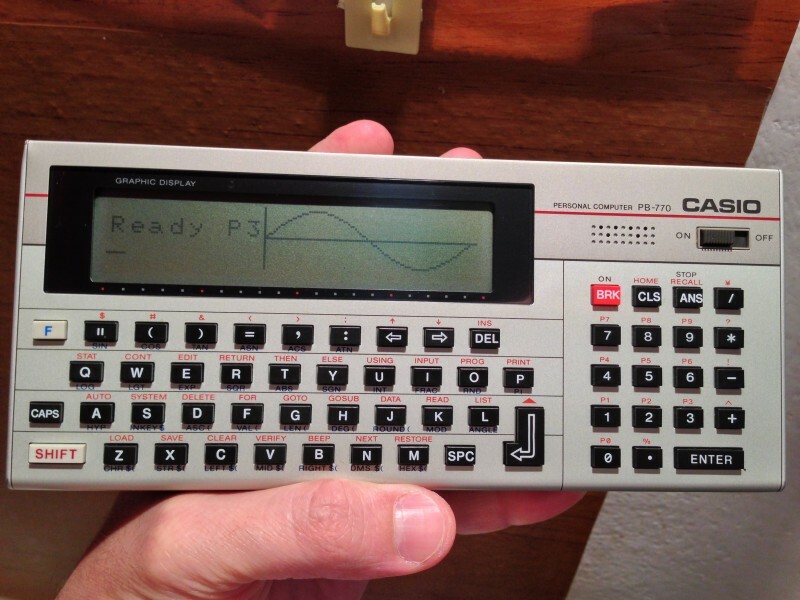 As a first step, I opened with much patience the case of the Casio PB -770 and I did a quick inspection. The quality standards of these small computers were not like nowadays ones. The original design often contained coarse engineering errors, having welding of obscene and unreliable flying leads as workaround. But in many cases these flying leads were just a choice, to save on the cost of motherboard, and produce single-sided printed circuits rather than double-sided ones. 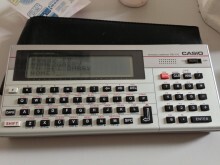 The Casio PB-770, as well as his ​​minor brothers and cousins, is no exception to this rule, proposing some internals to thrill, with colorful wires that perform roller coaster tracks. I inspected the memory chip, taking note of the parts code. Looking for about an hour on the search engines, I could not find any distributor that sells surplus rams of that kind. I opened the battery compartment, and removed and replaced both operating (of common AA), and backup batteries (a coin type) and… miracle! 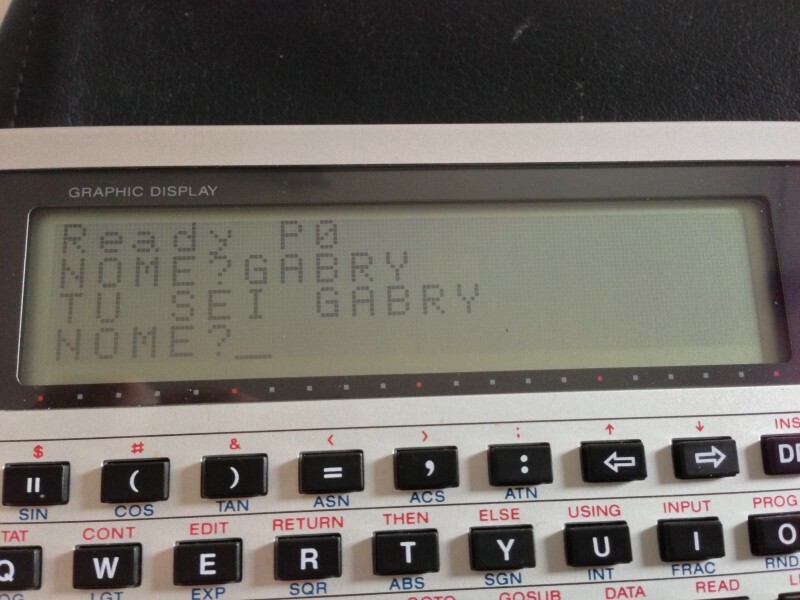 That was enough to bring my Casio PB-770 back to life! Probably there were dirty characters in memory that deceived the firmware and, in the absence of power for a few minutes, that information got lost, and memory was found to be perfectly functioning and free. 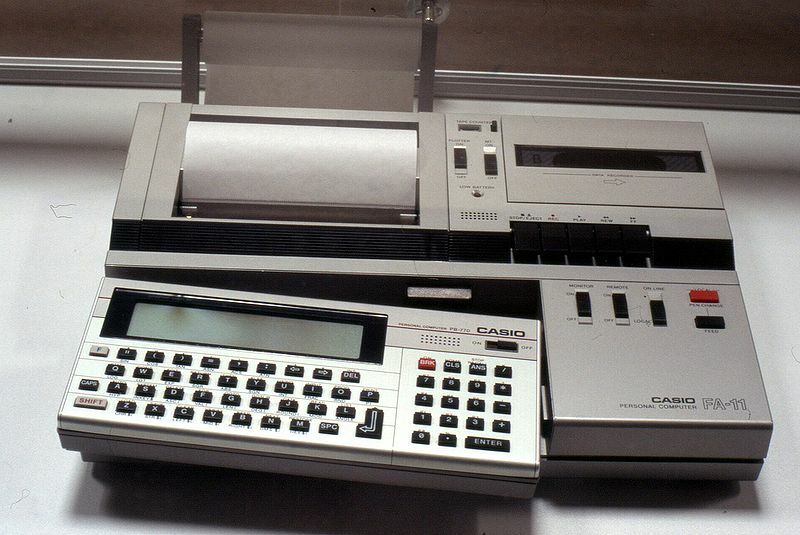 The Casio PB-770 had 8KB of RAM, and was expanded by small size proprietary cartridges, up to a maximum of 32KB which, for the beginning of the 80s, were a real luxury. 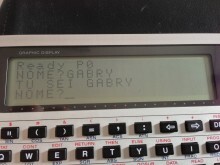 The large display with adjustable costrast was a prominent feature, with its 4 lines on 20 columns in character mode, and its 160×32 pixels in graphics mode. 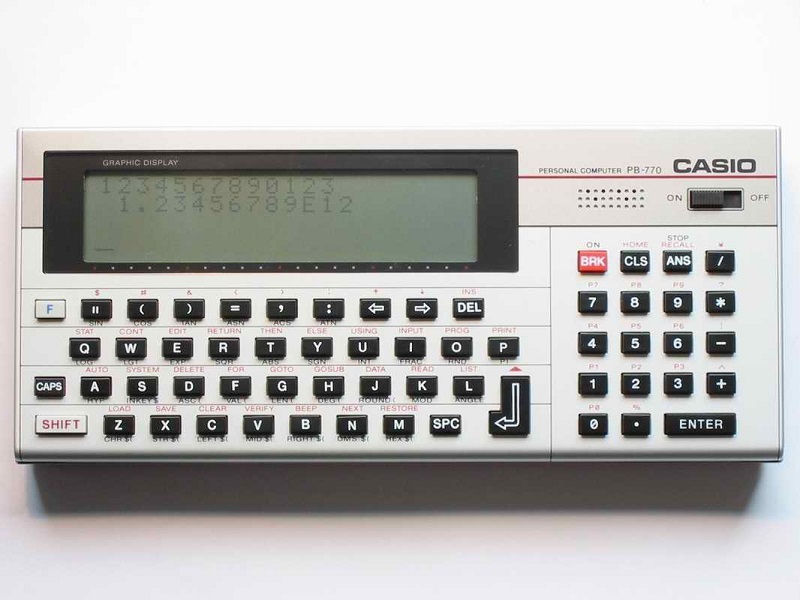 The Casio PB-770 was programmed in BASIC, and had a fairly advanced command set, also devoted to tracking graphs and histograms. It was possible to store up to 10 different programs in the internal memory, and it was possible to make sure they ran each other, interacting with each other, allowing the programmer to design an extraordinarily flexible and modular software architecture. Some people would say that this is luck; I think instead that a finding like that (low price, apparently not working) is just a reward for all the time spent scavenging debris in flea markets. I deal only to revise the translations, and move a couple of adjectives and subjects here and there. 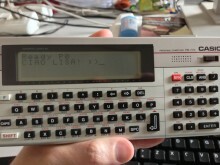 Are you aware of some DIY project to interface this pretty tiny beast via arduino or serial usb to a modern PC? I only know about some solution that operates over the dear old serial/parallel interfaces. 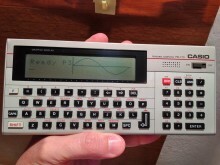 I was very fascinated by those little marvels, the Sharp PC-1500 and the more powerful Casio PB-700 and 770. I actually learned basic on these machines, and created useful programs, one of which was even published (and paid) on Bit, an Italian magazine of those times. 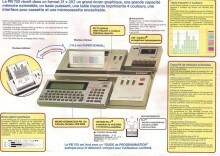 My most complex program on the PB-770 was developed to produce organization charts for my company. I designed and programmed it to enable the user to input up to 7 levels hierarchy and 9 job title positions boxes across, plus printing all connecting lines and avoiding possible boxes collisions. The printer itself was a very fascinating piece of electromechanical miniature machine, plotting in 4 different colors. Once enlarged on a photocopy machine to A4 or Letter size, these little charts were immediately usable, without having to wait for the draftsmen to manually create them. I still own one fully working PB-770, complete with the plotter and cassette recorder but unfortunately the little pens, and the paper rolls cannot be found anywhere in the US, at least to my knowledge. If anybody knows where to find pens and paper rolls please let me know. 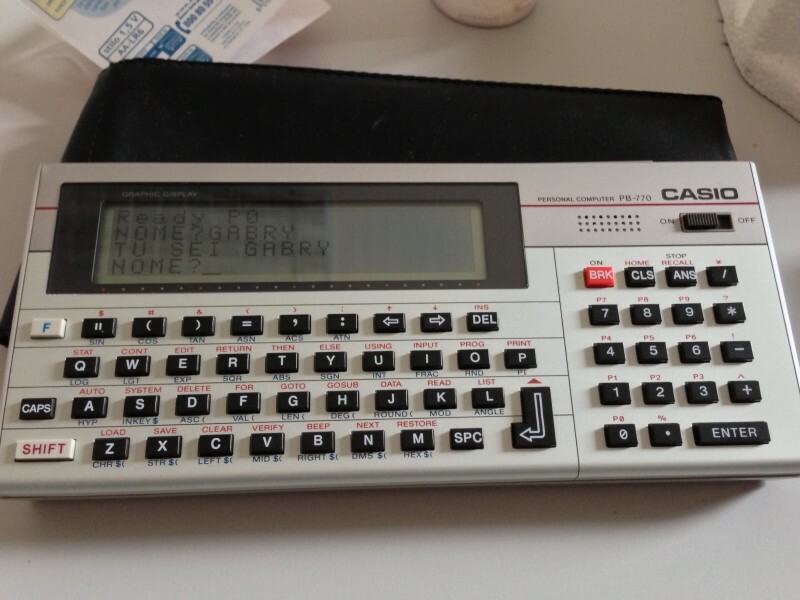 I don’t know if there are similarities between the Casio plotter and the Commodore/Sharp ones, but two years ago I managed to find an online shop who still provides and distributes pens for them, worldwide. Thank you very much for your prompt response. I would like to revive my system and be able to run the little plotter without worrying about running out of pens and paper. If you can point me to the right source, I would really appreciate it. I purchased two packs of them at https://www.thefuturewas8bit.com/plotter-pens-commodore-1520-oric-pcp40-tandy-cgp-115-atari-1020.html, but it seems they’re out of stock and not in the US. Sorry. Thank you Gabriele. I’ll check out those links. Years ago, I attempted to “reload” the little pens, by very carefully pulling out the tip and filling the cylinder with ink. I was using standard fountain pens inks so the “reloaded” pens did not always work. May be I’ll try filling the little pens with Ink jet printers’ ink and see it I can get them to work more reliably. Other Bits The Retrocomputing Retrogaming and NOT as you remembered them there. Martin 8-bit blog Written in Czech, The blog is dedicated in particular to the Z80 and the ZX80, which shows a replica. Nightfall Crew Retrocomputing blog One of the greatest Italian collectors. Limit, one of the curators, is an institution within the Commodore PET. old-computers.com The Bible and the retrocomputing retrogaming. Every fan should navigate the site at least once a day.